Series 9 9293s Wet & Dry shaver with charging stand and travel pouch, chrome. Series 9 - World's most efficient shaver*. Exceptionally gentle. With SyncroSonic™ technology and a Titanium coated middle trimmer. Five specialized shaving elements capture more hair in one stroke for fewer strokes and less skin irritation. SyncroSonic™ technology with 40,000 cross-cutting actions per minute. Multiplied by Sonic technology. Braun’s patented SyncroSonic™ technology reads and adapts to your beard. Checking its density 160 times per minute. Providing extra power exactly where needed most. The World‘s only 5-action alcohol-based Clean&Charge station automatically cleans, lubricates, dries and charges your shaver. As beautiful as gold yet much harder. Titanium is an extremely durable metal and highly resistant to corrosion. Plus, it makes quite an appearance. That‘s why Braun uses it for the coating of the trimmer. For perfect closeness that lasts longer. Independently flexible cutting elements mounted on a 10 directional pivoting head: MicroMotion combined with MacroMotion for maximum facial adaptability, giving you more skin contact for a more thorough shave. Lifts and cuts flat lying hairs. Aligns and cuts hairs growing in different directions. smoothens the skin for an exceptional shaving experience. All information at a single glance: the precise LED display shows battery status and travel lock indicator. The new premium charging stand minimizes the space you need in the bathroom and ensures your shaver is always fully charged. And it makes quite an impression. With Series 9 you can shave dry or use water, foam or gel for even better gliding and a smoother skin feeling. The state-of-the-art Li-Ion battery never loses performance and fully recharges in one hour. The premium LED display counts down the remaining minutes of shave time. Experience premium German engineering quality. All Braun shavers are waterproof up to 5 metres, so you can conveniently rinse them under running water or even shave under the shower. What's the difference between foil and rotary shavers? Rotary shavers are designed to work with cyclical movements while Braun foil shavers are designed to work with efficient sideways movements on the skin giving perfect control and precision. The foils protect the skin from irritation and are specifically designed to deliver the most thorough and comfortable shave from Braun. Do you have any recommendation on how to shave with an electric foil shaver? We recommend that you shave before you take a shower. Stretch the skin and shave against the direction of beard growth. At all times, hold the shaver at a right angle (90°) to your skin. Keep the pressure even to achieve the most thorough and comfortable shave from Braun. 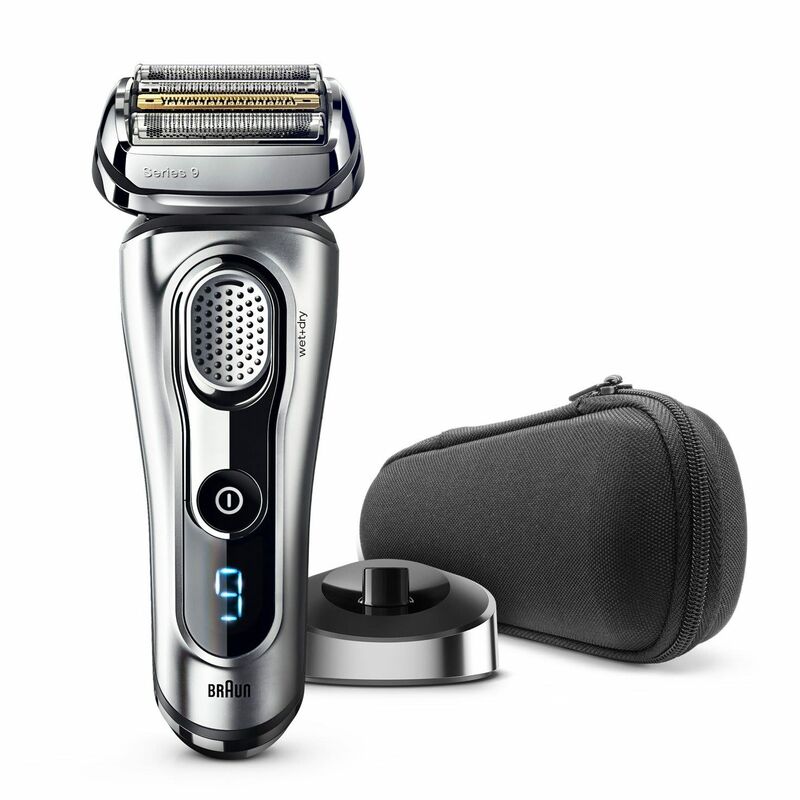 To trim sideburns, moustache or beard, Series 9 features an intergrated precision trimmer with superior cutting performance. In order to use this comfortable and precise tool, simply slide the trimmer upwards. The new Braun Series 9 cc shavers feature the Braun Automatic Clean&Charge Station, proven to clean more hygienically than tap water. The 5-action Clean&Charge Station: automatically cleans, charges, lubricates, selects cleaning program and dries at the touch of a button for lasting cutting efficiency. All Series 9 shavers are also waterproof up to 5m for full washability. How often do I need to change the shaver head? We recommend replacing all cutter parts every 18 months. To maintain optimal performance, we included a replacement part indicator in the display to ensure that you know when to exchange the cutter parts. Does the battery have a memory effect as we know it from cell phones or laptops? No, Series 9 shavers use a Li-ion battery which has no memory effect. You can recharge it whenever you want and it has a low self-discharge rate (vs. NiMh batteries). Li-Ion batteries are therefore the most powerful and long-lasting battery available for Braun shavers. Where is Series 9 shaver manufactured? Like all Braun premium shavers, Series 9 is designed, engineered, and manufactured in Germany to ensure the very best build quality and reliability. All of our shavers are designed and tested to last at least 7 years, giving you the peace of mind that you can continue to enjoy the unique Series 9 experience for a very long time.